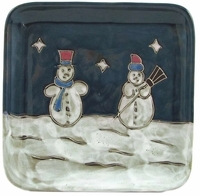 These Mara Stoneware Winter Mugs & Mara Stoneware Plates are decorated with snowmen and snowflakes. They make great gifts for friends and family for birthdays and Christmas. Mara Stoneware Winter Mugs and Mara Stoneware Plates can be used for entertainment pieces for serving your favorite wintertime cookies, hot cocoa, hot chocolate or your favorite hot tea, coffee, or even hot apple cider.